Arriving by train in to the White City is as romantic as it sounds, if not as glamorous as one hoped being the journey is long and rather sticky, even in First Class. Having boarded in Marrakech, Eisbär and I, imagining ourselves colonial travellers of the yesteryear, headed by train to the largest city in Morocco, Casablanca. 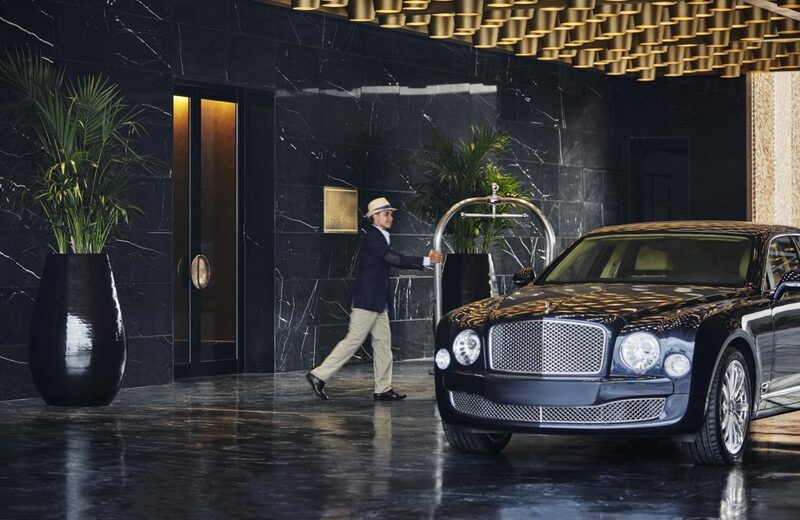 The journey is rather picturesque as it cuts through the arid dessert lands winding up to the Atlantic coast and the final destination of Casablanca, where luckily an air conditioned chauffeur was waiting for us to whisk us off to one of Four Seasons newest properties. Cutting through the wide streets of this city we could immediately see the stark contrast of the architecture here in comparison to Marrakech. In June 1907, the French attempted to build a light railway near the port, as an act of resistance and protestation, the locals attacked the French; riots ensued. In response, the French attacked by ship, bombarding the city from the coast, and landing troops inside the town, which caused severe damage to the town thus Casablanca does not have the oldie worldly feel of other cities in Morocco. The avenues are wider, the buildings more modern and more reminiscent of a colonial city built in a European style. 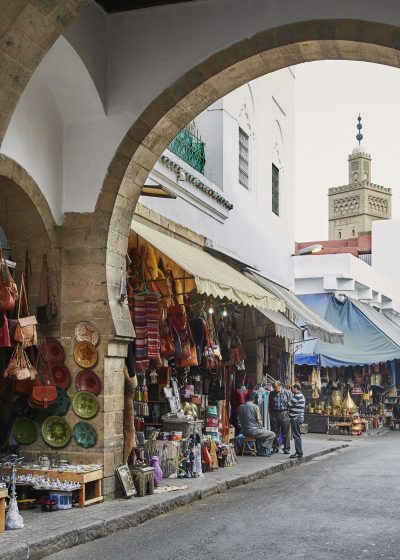 The French period Ville Nouvelle of Casablanca was designed by the French architect Henri Prost, and was a model of a new town at that time and is evident to this day in many of the streets of this city. 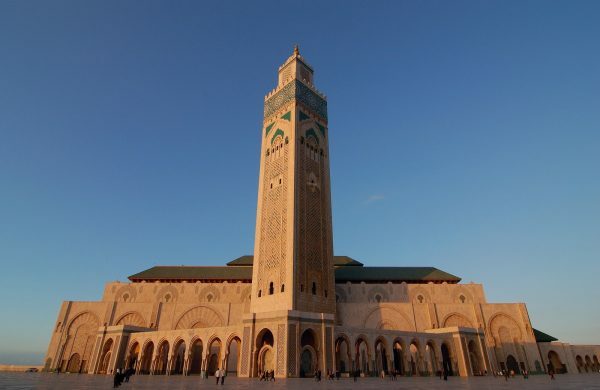 However, as we turned towards the coastal road the modern era of architecture of Casablanca came in to view, for Casablanca is the home to the largest mosque in Morocco and the 13th largest in the world, the Hassan II Mosque. With the mosque disappearing in to the distance we arrived at our destination and home for the next few nights, Four Seasons Hotel Casablanca. Driving up to the lobby on the lower ground floor we were greeted by Kenza Fakhir, the Guest Relations Manager, who escorted us in to the reception to check-in while our luggage was taken care off my the lobby staff. Eisbär and I were in for a treat as we were to be staying in the sprawling Signature Ocean-View Suite with 188 square metres of exceptional oceanfront luxury. 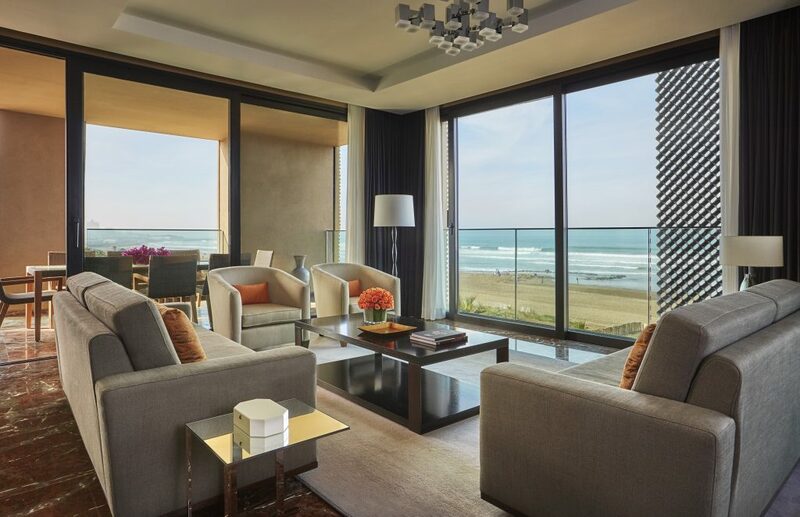 Overlooking the Atlantic, our one bedroom suite was needless to say impressive. 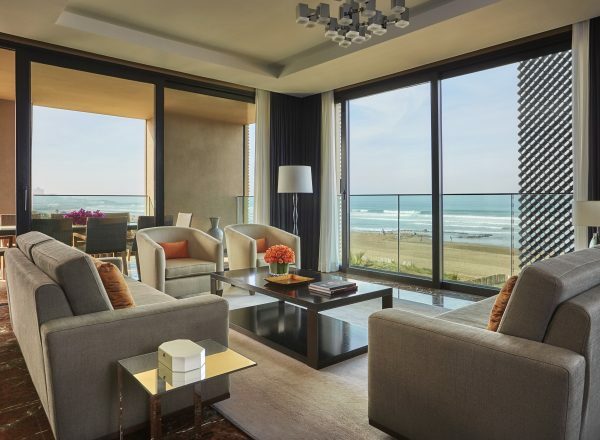 Designed in elegant brown marble with light touches of gold and pink in the living room and dining area, there was also a sublime bathroom oasis outfitted with a double vanity, glass-walled shower and a deep soaking tub from which you can look out onto the ocean. 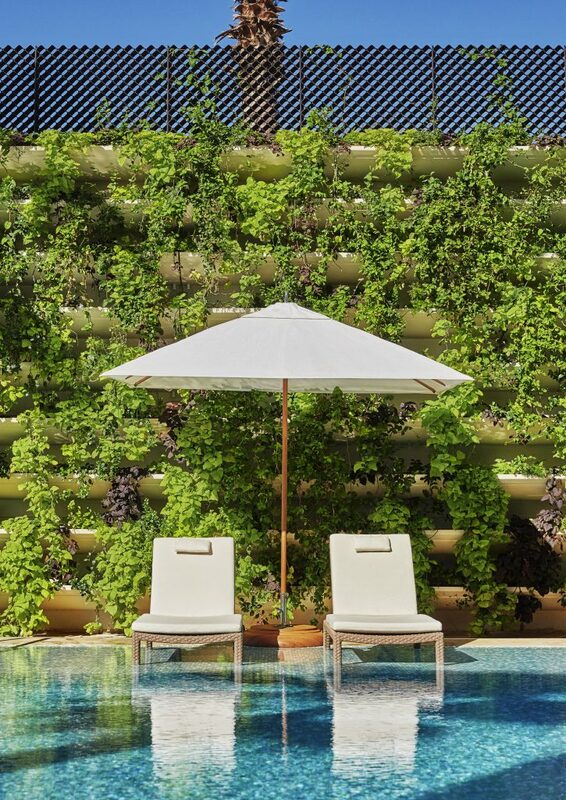 The bedroom was reached through a wide corridor that housed the bathroom and walk-in wardrobe, hidden behind a freestanding wall the bed was huge with 180-degree views through the floor-to-ceiling windows of the ocean, pool and hotel. 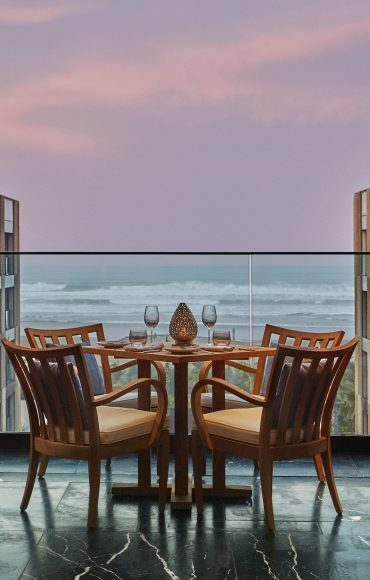 Elements inspired by Moroccan design are tastefully incorporated into the contemporary furnishings and colourful finishes and the inside is connected to the outside with a private balcony furnished with comfortable outdoor seating overlooking the beach and Atlantic beyond. After unpacking in to our walk in wardrobe Eisbär and I and I set out to explore the hotel. Housed in this intimate, five-storey building, Four Seasons offers 186 guest rooms, including 29 suites, there is also a spa, two restaurants and two lounges and an outdoor swimming pool. After a dip in the pool, and a few sumptuous non-alcoholic cocktails, Eisbär and I got ready for dinner at Four Seasons Hotel Casablanca signature restaurant, Bleu. 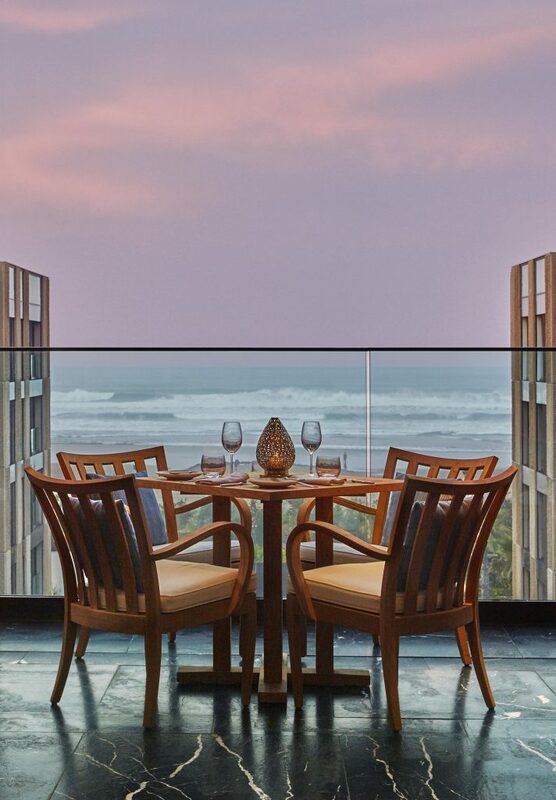 Overlooking the Atlantic, the Hotel’s signature restaurant is a contemporary brasserie, casually chic in style. 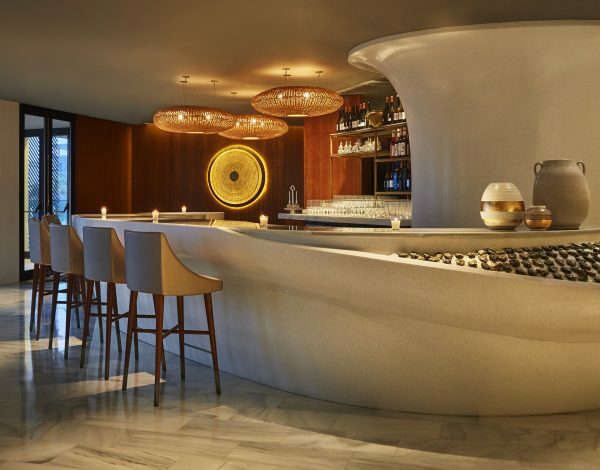 Casablanca’s coastline and the ocean inspire Bleu’s cutting-edge décor; from waves to nautilus shells, the focus is on curves, creating a soft, relaxing ambiance. The white marble floor, wood columns and brown-leather banquettes create an elegant, contemporary flair that is unique in Casablanca. 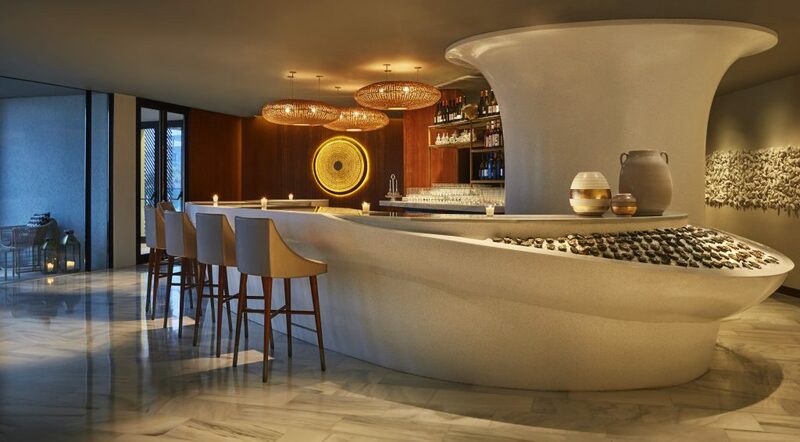 As we entered the first design feature that strikes you in the custom-made grill in the centre of the restaurant that exposes the chefs in action, while the raw bar features tartars, oysters and seafood tastings where the catch of the day can be seen on ice. After a mocktail on the terrace Romain Avril, Director of Restaurants, showed us to our table to start sampling the delights of this fusion Mediterranean restaurant. We started with Salmon Carpaccio with soya-lemon sauce and hot sesame oil, Crustaceans bisque with Lobster medallion, lemon zest, chives and a steak tartare. Our favorite was the bisque, which was rich and creamy; with the restaurant being so close to a wealth of seafood one could see why this dish was so fresh and tasty! We followed with a sort of surf and turf with myself opting for the Grilled lobster with sautéed potatoes and basil butter and Eisbär, ever the caveman, opting for the Black Angus rib eye steak with parmesan French fries, shallot confit and Béarnaise sauce. The lobster was sublime, literally plucked from the ocean, to the ice of the raw bar and then grilled right in front of your eyes at the custom-made grill, simple, succulent and seared, just how I like my lobster! Eisbär’s steak was a real hunk of meat, like he’d wrestled a cow and torn of a piece! Served on a wooden board with fries to mop up all the juices, Eisbär seemed to be happy, or so the silence would suggest. For dessert, as we were both somewhat stuffed, we opted for the lighter option of seasonal fruits and sorbet, which was just the perfect delicate dish to end our feast, all washed down with an infused tea made fresh at our table. Stuffed like prunes, Eisbär and I waddled back to our suite, where we relaxed in our opulent thick terry bathrobes on our private balcony watching the light from Hassan II Mosque beaming across the ocean at night to Mecca. 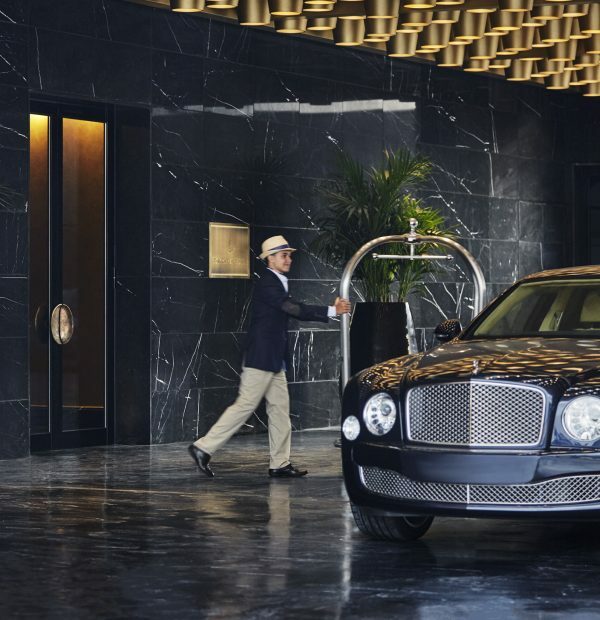 After a blissful nights sleep we were up early to sightsee tourist style this city of many faces for Four Seasons Hotel Casablanca had organised any amazing whistle stop tour of the top sights all aided by our trustee chauffeur and blacked out Mercedes. 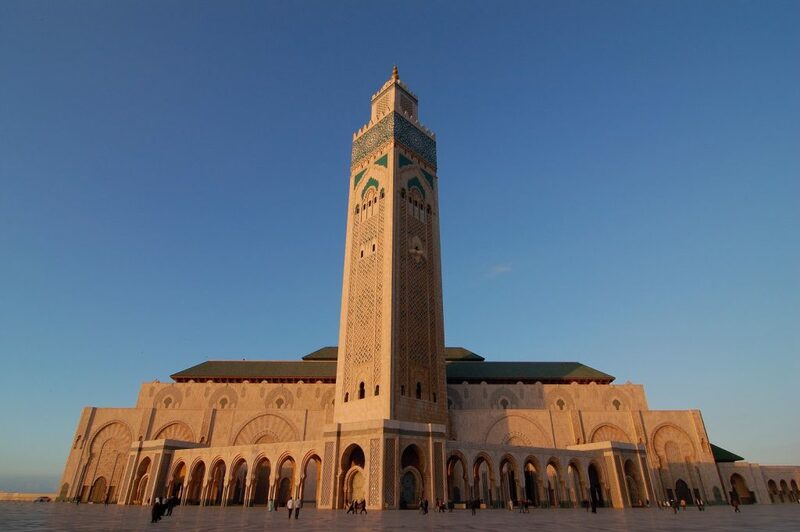 First up was the Hassan II Mosque, which was completed in 1993 and designed by Michel Pinseau and built by Bouygues. The minaret is 60 stories high topped by a laser, the light from which is directed towards Mecca. The walls are of handcrafted marble and the roof is retractable. A maximum of 105,000 worshippers can gather together for prayer: 25,000 inside the mosque hall and another 80,000 on the mosque’s outside grounds. All in all this mosque is VAST! Considering that usually non-Muslims are not allowed to enter mosques it was a real delight to be able to see the inside of this amazing construction, seeing is believing and the construction that went in to this building is mind-blowing. After the mosque we headed to the old town and the medina of Casablanca. To really understand Casablanca, you have to know the medina, the spot where the seed of the city fell long ago. The best entry point is the Marrakech Gate, with its imposing clock tower, which is where our chauffeur dropped us off. 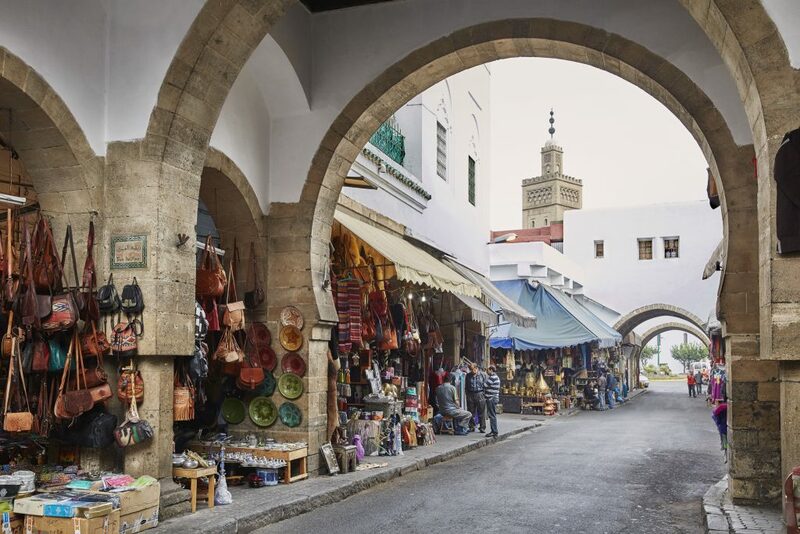 There are no reliable maps of this area but with a little twisting and turning, you may find your way to the old Portuguese fortress that backs onto the old city and also some of the better stalls with “local prices” for such delights as spices, leather and silver. Eisbär and I relaxed in a little café just off the clock tower square for a Moroccan Mint Tea and watched the world go by before heading back to Four Seasons Hotel Casablanca. Back at the hotel, and after a little spa action, we headed out for our last night in Casablanca, like Bogart and Bergman and all dolled up we headed to the famous Rick’s Café. Sitting at the bar and sipping on a G&T I started to wander why Casablanca is sometimes overlooked for its more famous counterparts Marrakech or Essaouira? 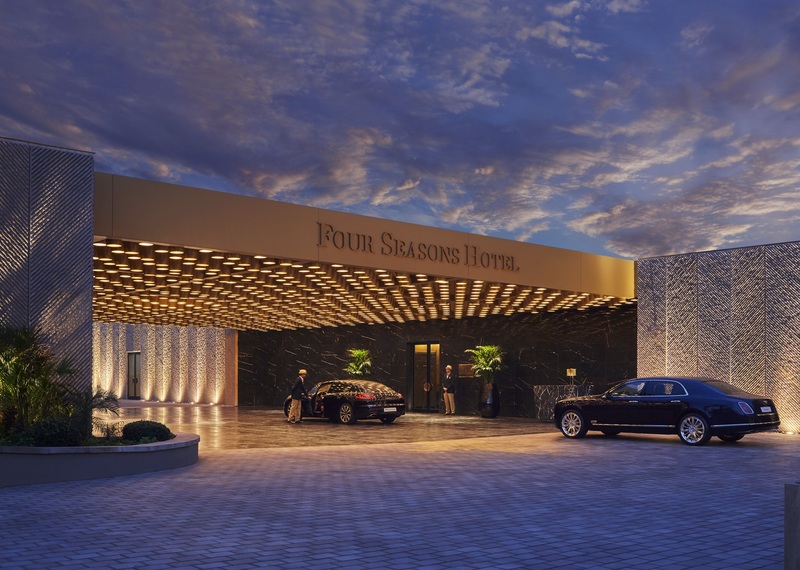 With many note worthy attractions, great food and beverage outlets, and gorgeous hotels like Four Seasons Hotel Casablanca I am glad I made the trek from Marrakech to sample the delights of this city. When many will always have Paris, Eisbär and I will always have Casablanca, and when staying at Four Seasons and experiencing the world-class customer service it is always the beginning of a beautiful friendship.